A large number of buses were impressed by the Royal Air Force in Malta during World War 2. These fall outside of this list for now, although it is hoped to include a list of such buses at some point in the future. The earliest known buses to have been owned by the RAF and operated in Malta are a trio of Commer Commando coaches with Park Royal "one-and-a-half-deck" bodywork. The known details for these comes from research carried out by historian Mike Fenton and contained within his database. Notes: Disposed of locally on the island in April 1956 - further history not known. ​The fate of these buses is not known. They certainly did not see further use with their original bodywork, and nothing so far suggests their chassis were reused as local route buses. It is possible their Park Royal bodywork was scrapped, and the chassis reused as lorries. It is of course quite possible they were exported for re-use elsewhere. They may also have been scrapped or dismantled for spare parts. They should not be confused with two similar buses which were used on shuttle work between Luqa and Valletta - initially owned by BOAC, and then several Maltese-based airlines (which also entered service in the late 1940s, ran until the 1960s, and had different chassis numbers). Whilst no photographs have surfaced of the RAF Commers in Malta, there is a photograph of a restored example which can be viewed by clicking on the "More info" button. It is presumed that the examples in Malta were in the same livery, but this is yet to be confirmed. The vast majority of the known data about RAF buses in Malta comes from an examination of the MT record cards held by the RAF Museum in Hendon (north London). These cover the period 1956 through to the mid 1970s when the RAF left Malta. A number of the buses (especially the later ones) are known to have seen post-military careers in variousd civilian roles. The notes for each vehicle reflect this where known. Some of the buses listed went on to see further use with the RAF after their career in Malta - either in the UK, or elsewhere around the world where the RAF needed such vehicles. Again where such detail is known, it is included in that vehicles "notes" section. The RAF Museum record cards do not cover the period prior to 1956, so it is not known what buses the RAF had based in Malta at this time. They alsmost certainly operated a fleet of Bedford OB/OWB buses after the Second World War (like the Admiralty did), but details are lacking currently. Notes: Delivered to RAF Cosford for storage 20/01/1965 . Allocated to NEAF HQ 28/04/65. Reallocated to NEAF (Malta) 24/07/72. Withdrawn 23/1/78 and sold to Malta Police who registered it MP165 and then M-0106. Part of a large batch of withdrawn government vehicles sold to Roc-A-Go Crane Services, Tal-Barrani Road, Zejtun in July 1999 – primarily for scrap. Notes: Delivered to RAF Cosford for storage 30/04/1965 . Allocated to NEAF HQ 09/06/65. Transferred to RAF Dhekelia (from RAF Akrotiri) 19/01/72 and to Malta (RAF Luqa) 13/07/73. Withdrawn 10/08/78 and sold to Malta Police who registered it MP193. Possibly later became either M-0128 or M-0130, in which case it probably passed to Roc-A-Go around 1987 for scrap. Notes: Delivered to RAF Cosford for storage 30/04/1965. Allocated to NEAF HQ 29/06/65. Reallocated to NEAF (Malta) 24/07/72. Withdrawn 23/01/78 and believed to have been disposed of locally. It was registered M-0340 in early August 1978 and allocated to the Department of Health at Mount Carmel Hospital, Attard. It was described as being cream in colour and seating 33. No further details as to its fate are currently known. Notes: Delivered to RAF Cosford for storage 15/11/1965. Allocated to AHQ Malta 17/12/65. To NEAF HQ 12/05/67, then reallocated to RAF Luqa 24/07/72. Struck off charge 10/08/78 and disposed of locally to Malta Police who registered it MP192. Possibly later became either M-0128 or M-0130, in which case it probably passed to Roc-A-Go around 1987 for scrap. Notes: Delivered to CVD Hilton for storage 13/01/1970. Allocated to NEAF 25/09/70. Transferred from RAF Epiakopi to RAF Luqa (Malta) 14/08/73. Withdrawn 20/04/77 and sold to Malta Police who registered it MP157 – later M-0098. On 17th January 1986 it was one of several minibuses listed as having passed from Malta Police to the Department of Agriculture and Fisheries. In July 1994 it was sold on the proviso that it would not be used on the road. The plates were returned. This vehicle was seen near Qormi in May 1993 in a scrapyard owned by the Agriculture Department (south side of road 8). By May 1996 this site had been cleared and the bus was noted in a scrapyard near Ghar Dalam (beside Triq tax-Xerrieq). The remains were still there in April 2007, but were no longer visible in October 2008. Notes: Delivered to CVD Ashchurch for storage 15/04/1970. Allocated to NEAF 27/06/71. Last allocated to RAF Luqa when withdrawn 02/05/77. Sold to Malta Police who registered it MP158 – later registered M-0096. On 17th January 1986 it was one of several minibuses listed as having passed from Malta Police to the Department of Agriculture and Fisheries. At the time of the transfer, it was listed as seating 15 passengers (plus the driver). In January 1988 permission was given to dispose of the bus for scrap. The sale finally took place in December 1988, on the basis that it could not see further use on the road. Notes: Delivered to CVD Irvine for storage 25/05/1969. Allocated to Air Support Command 29/05/69, CVD Irvine 17/06/69, Marshall's of Cambridge (Contract Loan) 04/08/69, CVD Hilton 16/10/69, NEAF (at RAF Luqa) 21/07/73 and withdrawn and locally disposed of by 10/01/79 to Maltese Police who registered it MP191. Re-registered M-0103 in October 1980. Tender awarded in November 2002 for the sale of unserviceable Police vehicles for scrap. Notes: Delivered to CVD Irvine for storage 18/04/1969. Allocated to Air Support Command 08/07/69, CVD Irvine 25/08/69, Marshall's of Cambridge (Contract Loan) 08/11/69, CVD Hilton 17/11/69, NEAF (at RAF Luqa) 23/11/73 and withdrawn 10/08/78 and locally disposed of by ?19/02/79? to Maltese Police who registered it MP194. Around 1980 reregistered M-0101, the allocated new registration M-1119 by January 1982. In August 1982 fitted with a Perkins diesel 6354 engine number 354UR26835. Transferred to the Public Works Department (Kirkop Workshop) by May 1990. Disposed of by May 1996. Livery in 10/1988 was buff with green wavy lines but by 5/1993 had been repainted yellow and white with the Department of Works & Sport with fleet number 10. At Kasparell’s scrapyard, Birzebbuga in yellow and white livery by May 1997. Its flattened remains were still visible November 1997. Not seen since, assumed scrapped. Notes: Delivered to CVD Ashchurch for storage 02/04/1970. Allocated to NEAF HQ 28/11/71. Last allocated to RAF Luqa when withdrawn 20/04/77. Subsequently noted in use in Malta with registration 68013. It was last seen disused on Luqa Industrial Estate and had been removed from airport property when found to have been used by drug addicts. Sent to Hompesch Steel for scrap in 2005. Notes: Delivered to CVD Irvine for storage 26/02/1970. Moved to CVD Hilton for further storage 08/09/71. Allocated to NEAF (RAF Luqa) 23/10/72. Struck off charge 16/03/78 and sold to the Maltese Government who allocated it to the Maltese Police. Initially carried registration MP174, and latterly M-0105. Transferred to the Medical and Health Department in June 1986 – possibly allocated to the St Vincent de Paule residence for the care of the elderly. Finally left government ownership (back via the Police and the Education Dept.) in November 1991. Believed to have been sold for scrap. Notes: Delivered to CVD Irvine for storage 16/04/1970. Moved to CVD Hilton for further storage 08/09/71. Allocated to NEAF (RAF Luqa) 28/06/72. Struck off charge 14/12/78 and believed to have been disposed of locally to the Maltese Police Force, where it became M-0107. Sold for scrap around August 1987. Notes: Delivered to CVD Irvine for storage 16/04/1970. Moved to CVD Hilton for further storage 15/09/71. Allocated to NEAF (RAF Luqa) 28/06/72. Struck off charge 14/12/78 and believed to have been disposed of locally to the Maltese Police Force, where it became M-0102. Part of a large batch of withdrawn government vehicles sold to Roc-A-Go Crane Services, Tal-Barrani Road, Zejtun in July 1999 – primarily for scrap. Noted as scrapped November 1999. Notes: Delivered to CVD Ashchurch for storage 15/03/1972. Allocated to NEAF (RAF Luqa) 01/06/72. Struck off charge 28/04/78. Sold to Maltese Government and used by the Ministry of Works - towards the end of February 1979, registration number 76523 was allocated. Around the early-mid-1980s registration M-0816 was allocated. In March 1988 it was listed as being “on the complement of the Education Department” although still owned by the Public Works Department. In June 1992 it was recorded as having been on loan to the School of Building, Gerolamo Cassar, Floriana, though was now at the Kirkop Garage of the PWD. On the 1st March 1996 M-0816 was declared by the Department of Labour as being unserviceable and to be sold for scrap. In July 1997 the bus was sold for scrap and the plates returned. Notes: Delivered to CVD Ashchurch for storage 12/04/1972. Allocated to NEAF (RAF Luqa) 28/06/72. Struck off charge 10/08/78 and sold to Malta Police who registered it MP195. Further details lacking. On 7/6/67 the separate "Malta" and "Near East Air Force" commands merged to form a new enlarged NEAF command. MODDS = ??? MOD Disposal Service ??? NOTE - The "New" dates shown above are when the bus entered use with the RAF - it may have been physically newer at an earlier date. 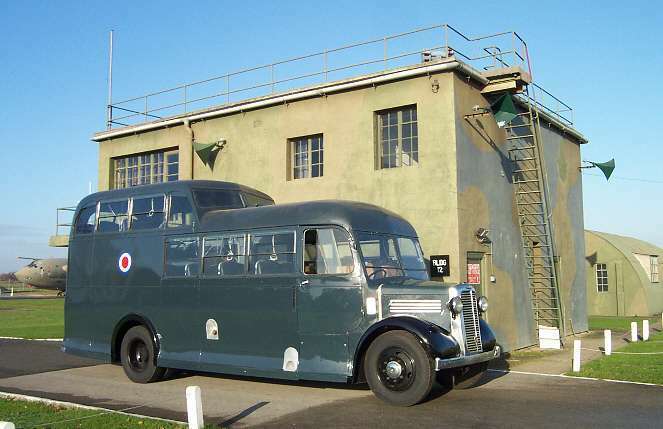 *** HELP REQUIRED *** We are looking for photographs of any of the above buses, further details of the above buses, and any additional buses known to have been used by the RAF, and confirmation of the livery the buses operated in.